There are several different species of Jewel Fish; all are very beautiful but aggressive members of the cichlid family. Jewel Fish will attack its own species as well as any other fish, no matter the size, when in breeding season and while rearing their fry. Therefore, for purposes of breeding, the Jewel Fish should be kept in a separate aquarium, set up and maintained for just the needs of this species. As a first or second breeding experience, this fish is worth the trouble: it is easy to breed, and the mated pair do all the work of fry rearing. When young or not excited, the Jewel Fish is a dull olive color overall, with three black dots on its sides. However, when it wears courting colors the Jewel Fish is absolutely beautiful. In breeding season, the head and belly turn a fiery red and the scales on the flanks and gill-plates sparkle like blue-green jewels. All the fins are edged with brilliant red, and shine profusely with blue-green spots. The black dot in the center of the body disappears entirely when a pair of Jewel fish are ready to lay eggs. To tell the difference between the sexes, look for a plump female: when in breeding condition the female will be full of roe (eggs). The male is even more jeweled than the female, particularly in the regions of the gill-plates, the flanks, and the tail fin. His is not necessarily the brightest red however; indeed, at times the female is so brilliant that the uninitiated might consider her to be the male. The Jewel Fish, is an open water spawner, which means it looks for a place to dig holes for spawning activities. Once a male and female have bonded, they form a definite partnership, and will kill all others of their species if given the chance during the breeding and fry raising process. 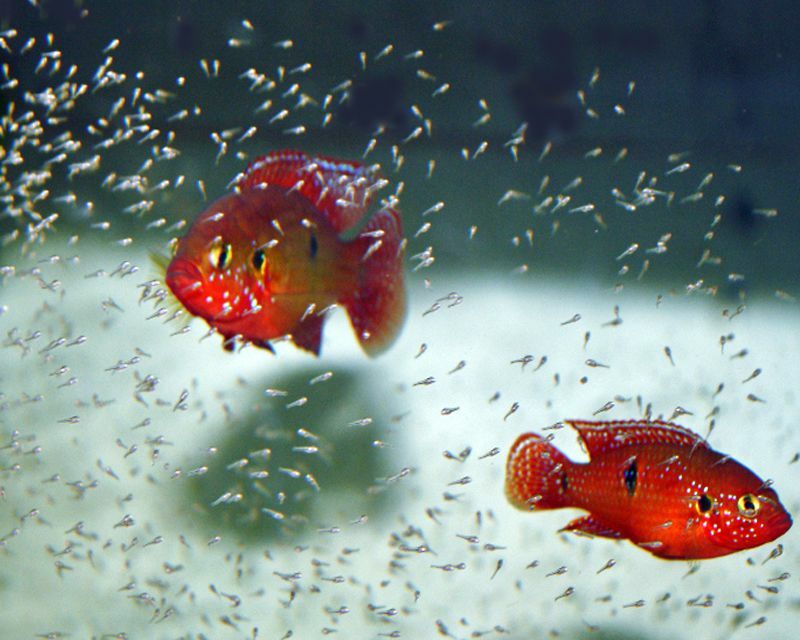 Unlike other cichlid species from Africa, the duties of egg care and fry raising are split evenly between two very attentive parents. The young fish are cared for even when they are well able to go out on their own. Sometimes the family will stay together until the fry are almost ready to reach sexual maturity. A cichlid lover will get great pleasure out of the Jewel Fish, especially when a well-matched pair devotes themselves unreservedly to caring for their brood. For months, they may be observed guiding their offspring around the tank, showing off their splendid coloring during the entire process. Feeding a Breeding Pair: Care of this species is not difficult. They are not choosy about food, but must be provided ample live and frozen protein rich foods before and during the spawning and fry raising period. Feeding the Fry: The Jewel Fish fry are able to devour baby brine shrimp and finely ground fry food immediately after hatching. The parents will make sure they are safe and well fed by leading the brood to wherever the food is provided. They are large fry, and the parent fish will herd the family around the tank in search of infusoria, micro algae and edible tidbits around the bottom of the aquarium. It is for this reason that, for best results, the breeding aquarium should not be a bare tank with “new” water; it should be well established with thriving live plants, to insure ample food supply for the fry in their first three weeks of life. After three weeks, the fry will greedily accept anything they are offered, but for fastest growth continue feeding at least some fresh and frozen baby brine shrimp for the protein. A full belly is a healthy belly with any growing cichlid, so feeding should be often. Water Conditions: The Jewel fish is not particularly choosy about Ph or hardness within reason, since they are flood plain dwellers in nature. However, these fish must be provided an efficient filter system, to ensure clear water at all times. It is also important to maintain a steady temperature from 78 degrees Fahrenheit to 81 degrees Fahrenheit for breeding to take place. Tank size: Recommended tank size is 30” X 15” X 15” This may seem like overkill, but with up to 200 surviving fry, the space is needed for fry rearing. Hardness: 120 – 150 p.p.m. is ideal, but they are a relatively forgiving species so close is good enough. Spawning Media: This species prefers a terracotta flower pot, turned on its side and aged in an established aquarium for at least a week. The size of the opening should be from 3” to no more than 5”. They seem to like the illusion of a cave. Breeding Method: As with other medium-sized cichlids, Jewel Fish go through a mating ritual which looks like fighting; then the pair will be close to each other for several days, finally laying eggs and fertilizing them side by side, egg by egg. Egg Size and Number: Mature Jewel Fish produce 250–300 yellowish eggs that are about half the size of a beebee. Hatching Time: The eggs hatch in three days; no intervention is required or suggested. The parents will constantly fan the eggs and pick at them to remove fungus and dead eggs. There is no danger that the parents will eat the eggs. Fry Wiggling: Once born, the fry will be hidden by the parents for several days, probably still within the safety of the flowerpot. They are helpless during this time, but protected by the parents with their very lives. Free-Swimming: Within the 7th day, you should see the proud parents showing off their newly swimming fry cloud, making short ventures, herding them to find micro food around the bottom of the aquarium. Food First Week Day 8–21: Jewel Fish fry will eat baby brine shrimp, micro worms, and finely ground fry food, all of which are very rich in protein. Food Beyond 21 Days: The fry will constantly be hungry, foraging in the cloud with the parents careful and watchful eyes, but at this point they can eat high quality, high protein flake food, ground in your fingers. They will eat just about anything; as long as you keep the flow of baby brine shrimp and daphnia coming, they will grow very quickly. Should You Breed Jewel Fish? It is strange that such an aggressive species as the Jewel Fish is one of the most docile and devoted of all freshwater fish parents. If it were not for their hostile disposition, this brightly colored fish would certainly be one of the most popular of the cichlid group and a staple in almost every community aquarium, right alongside the Angel Fish. Once you have a mated pair, getting them to breed will never be a problem, the problem is what to do with the fry. The Jewel Fish is the one cichlid that everyone admires for its beauty, but no one wants in a community aquarium. The parents will not eat their fry like so many other cichlids, and will go on making more and more. Give this some thought before you begin, but the rewards of breeding this fish are unending. Especially, in a classroom situation, the Jewel Fish is ideal, the husbandry displayed will fill many class discussions about life in general.